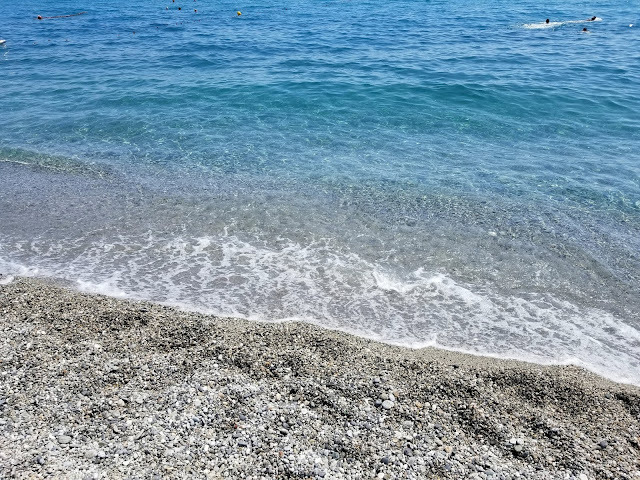 Roccella Ionica, situated along the Ionian Sea coastline, originates back to ancient Magna Graecia. It is dominated by a rocky promontory on which the Carafa Castle stands, which is from the Norman period, built by Gualtieri De Collepietro. 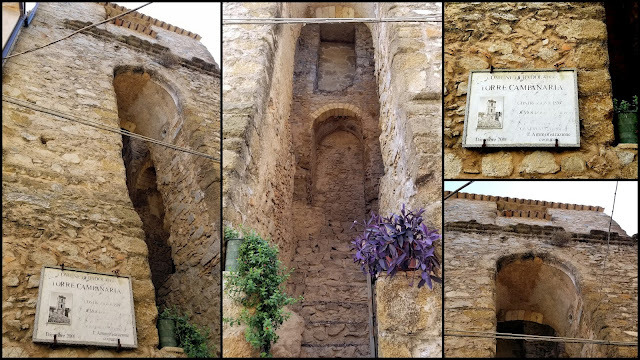 The building passed to the Ruffo family for several generations, then the Crotone's Marquis, Antonio Centelles and finally, to the noble family Carafa Della Spina, which partially rebuilt and restored it. It survived the attack of the Turkish Dragut Pasha in 1553. The castle ruins are an imposing sight to see! The castle is protected by a tall fence, and limited tours are provided. In recent years, some EU funded restoration has been taking place to help preserve the ruins. 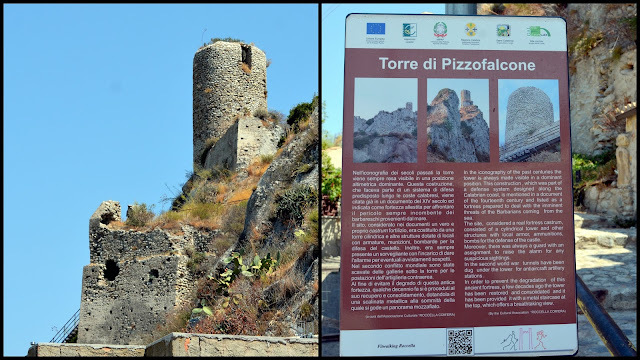 The Pizzofalcone Tower is also located on the promontory. It is the only surviving structures of the ancient castle of Roccella de S. Vittore. 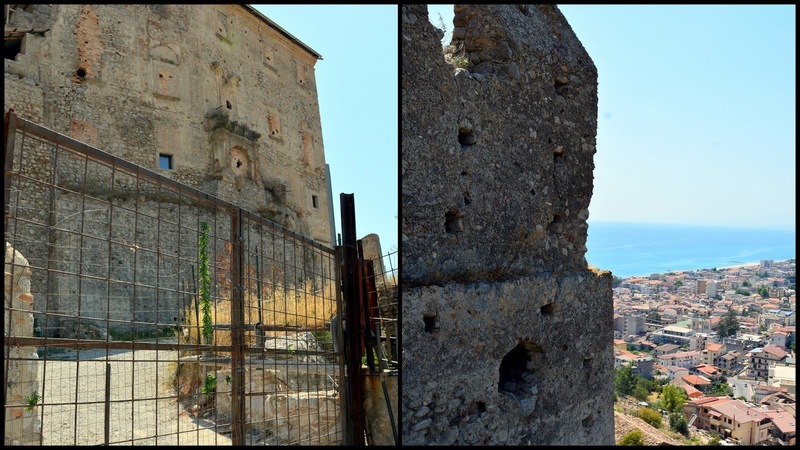 It is a remaining part of defense system along the Calabrian coast that was built to "keep invading barbarians out." The views of the castle, tower, and also the town and shoreline below were so very picturesque. Despite its ancient origins, Roccella today is a modern town with many tourist attractions. Its beaches are often awarded "Blue Flag" certification for excellence. Every year Roccella Ionica hosts a jazz festival called "Rumori Mediterranei" that has become appreciated by both the public and music critics. We visited Mammola one afternoon to dine in one of its famous "pescestocco" or stockfish (dried Norwegian codfish) restaurants. 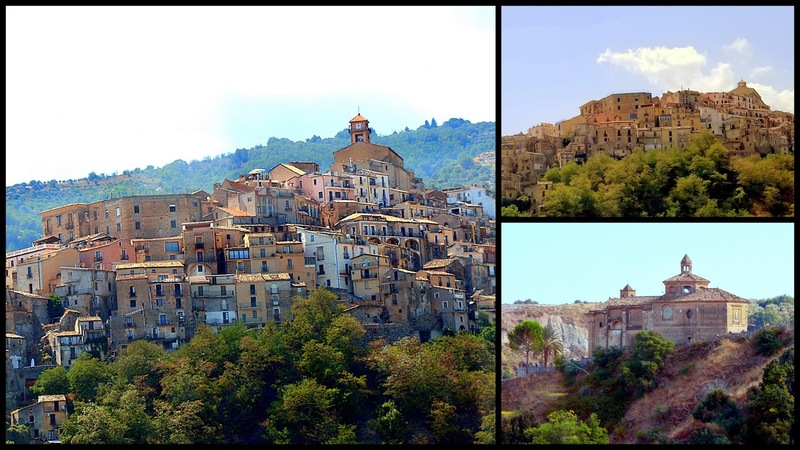 Mammola is a charming village located between the Serre and the Aspromonte Mountains. Legend has it that the natural mountain spring waters found in Mammola are mineral rich and provide the dried cod with exceptional flavor as it is soaked. The meal we enjoyed had a sampling of all the traditional ways that the cod is prepared and it was all very delicious! 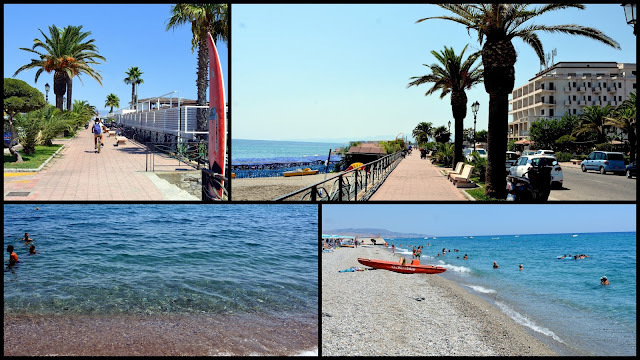 Another afternoon, we visited the town of Siderno, to enjoy its beaches along the Ionian Sea. The water was crystal clear and warm. 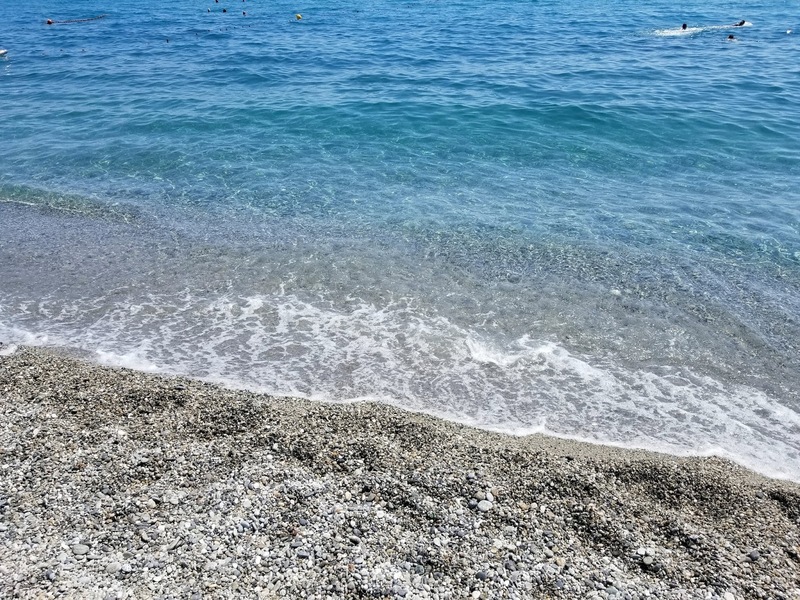 Unlike Roccella, whose beaches are fine sand, the shore of Siderno is made up of small pebbles. Years ago I collected quite a bit of pretty pieces of sea glass from the shore, but I did not see much on this trip. Siderno has a pretty walkway along the coast, called a "lungomare" in Italian. There were terrible storms a few years ago and much of the walkway had to be rebuilt. 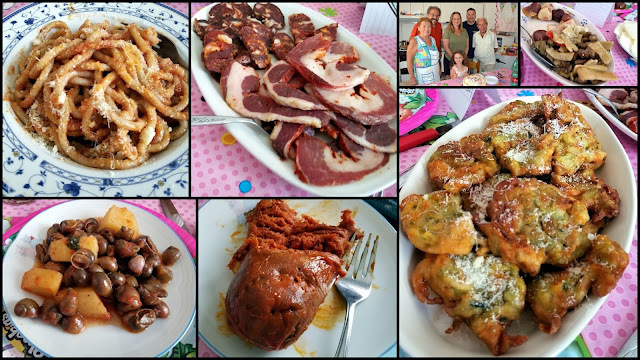 My husband's oldest sister and her husband live in Siderno, and she prepared one of the most delicious meals we enjoyed in Italy! A son and daughter-in-law and granddaughter were also visiting from the US at the time, so we had a belated birthday celebration for my sister-in-law. Wonderful memories with family, and more beautiful Calabrian moments to savor. We would next be leaving Calabria and flying to northern Italy, to visit my husband's relatives in Genoa and Bologna. We also took side trips to Verona, Padua and Lake Maggiore. 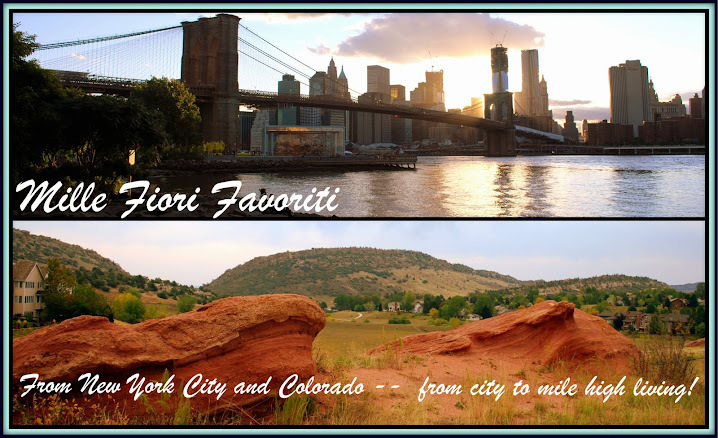 More about those places in future blog posts! I'm back from a fun week away in Disneyworld, Florida, with my daughter and son-in-law and granddaughter, followed by a week of recovering from the flu! Even though I had gotten a flu shot this autumn, and as much as I used hand sanitizer and antiseptic wipes to clean everything while I was away, I still succumbed to the virus. Thankfully, I realized immediately that I had the flu and went to my doctor who prescribed Tamiflu medication, which decreased its severity. Also, thankfully, no one else came down with it. 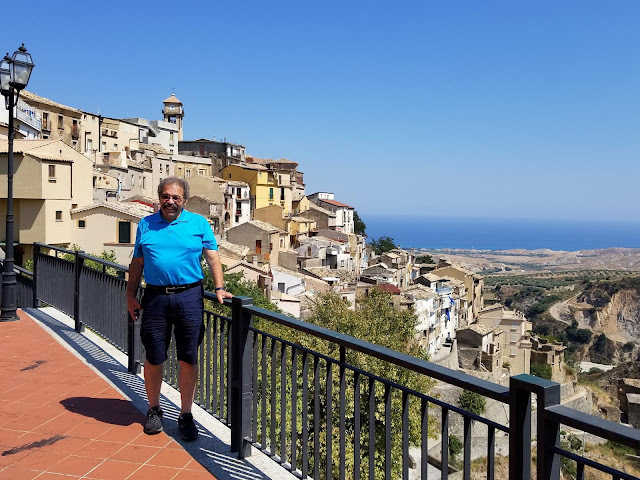 Now I'm back to reminiscing about my husband and my trip to Italy last summer, and the beautiful and historical town of Gerace in Calabria, Italy, that sits 1,640 feet (500 meters) high cliff, and six miles, (10 kilometers) from the Ionian Sea coastal town of Locri. 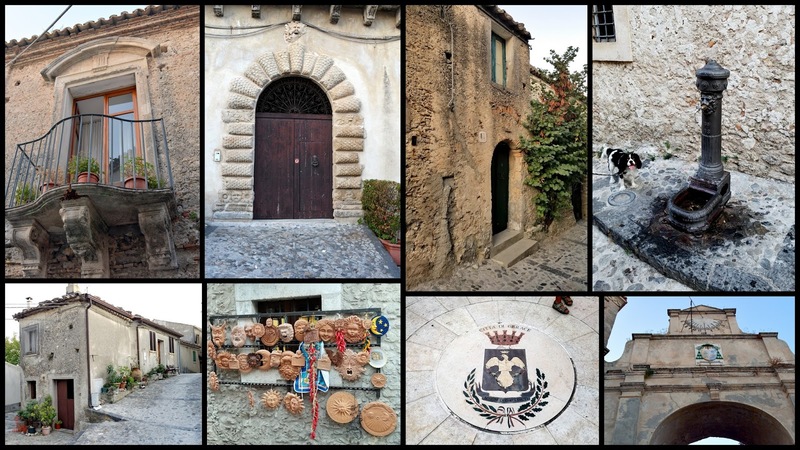 It has been called one of the prettiest villages in Italy. We drove up the winding roads towards the city along with my husband's cousin, her husband and children, and grandchildren to spend a few hours in the late afternoon, early evening. 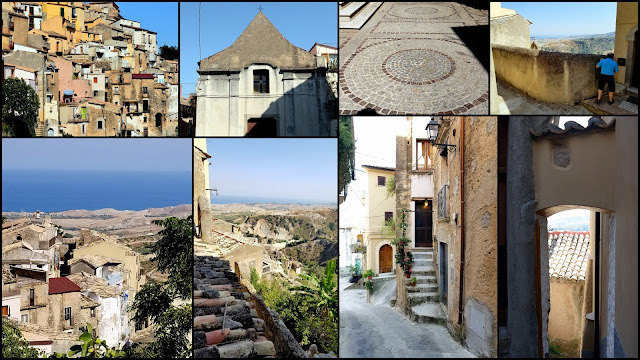 We visited Gerace years ago, on a visit to Italy with our children, and we were looking forward to seeing it again. During our first visit, we toured its churches--it has quite a few remarkable ones worth seeing, but this visit was going to be more about enjoying its scenery and to have a gelato break. ...displays a distant view of the Ionian Sea and the ancient city of Locri. Everywhere is the odor of wild fennel, jasmine, and bergamot. In fact, 90% of the world's supply of pure citrus bergamot comes from the Reggio Calabria province of Calabria. 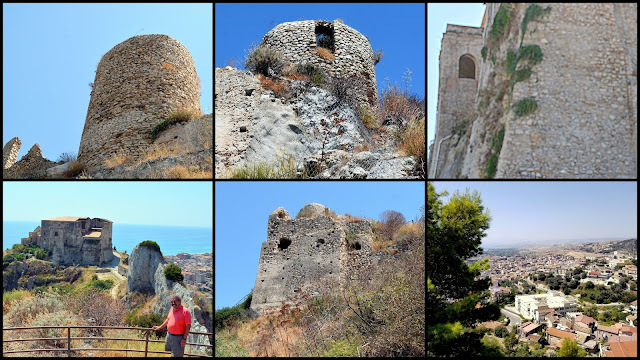 One of the most remarkable sights to see in Gerace is the ruins of a 10th century, Norman Castle. Gerace was originally developed by inhabitants from Locri in the 9-10 century when they were defeated by the Saracens, Over the following centuries, it fell under the control of many different groups such as the Byzantines, the Normans (including Robert Guiscard in the 11th century) and the Angevin. This Italian/English placard describes the history of the castle and its construction and layout. 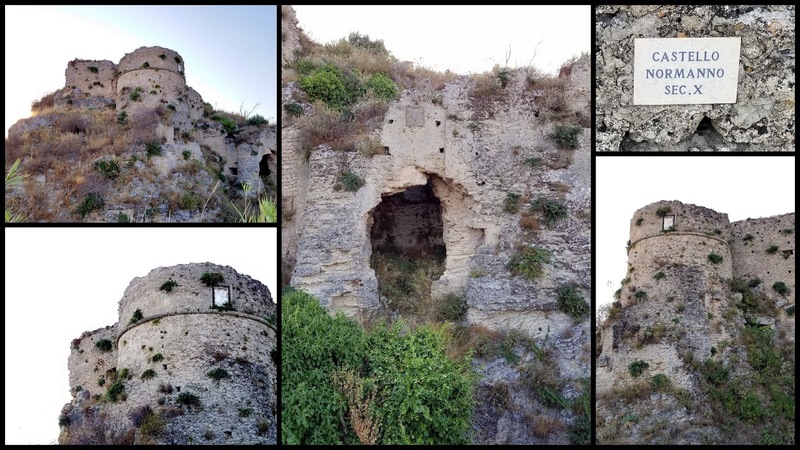 It was hard not to look at the castle and imagine what life was like in Gerace many centuries ago! We walked around the town center, over the cobblestone streets, and through winding alleys. There was much beauty to see. 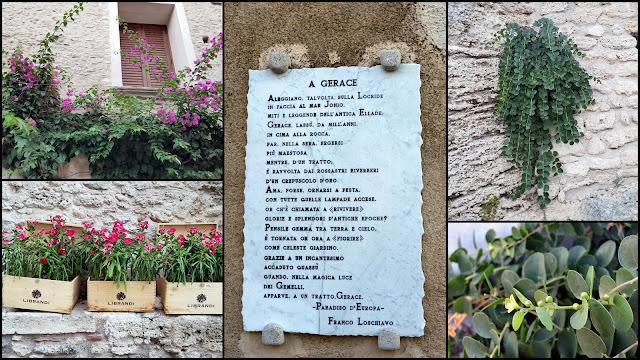 A poem in Italian about Gerace's ancient beauty, and wild capers that we saw growing along the walls of the city. We watched the lights of the city come on at dusk and enjoyed some delicious gelato together in the town piazza before we returned home. 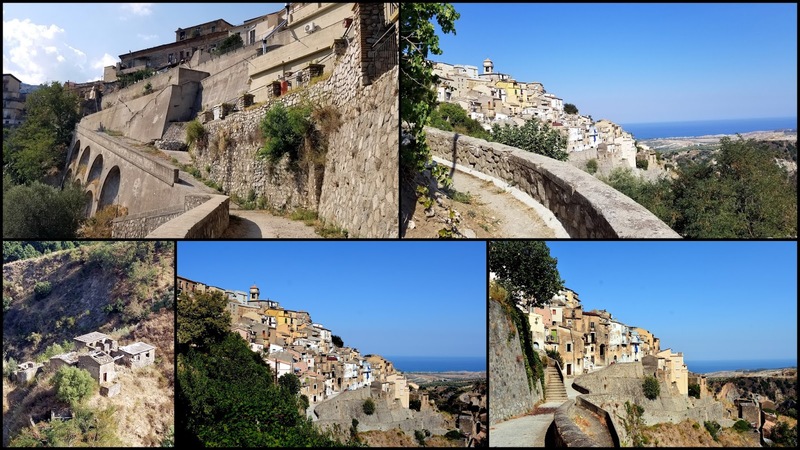 It was another memorable visit to Gerace. 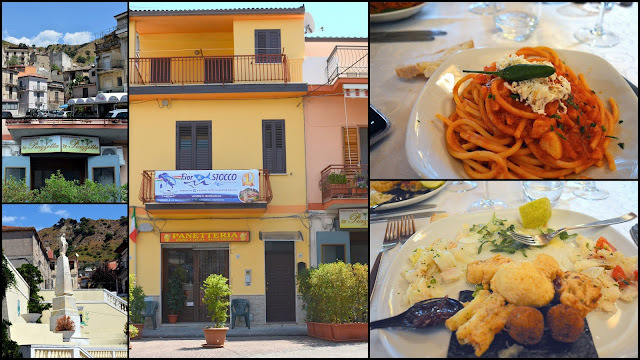 It is definitely one of Calabria's gems! To give you a better idea of where Badolato is located you can refer to this map. 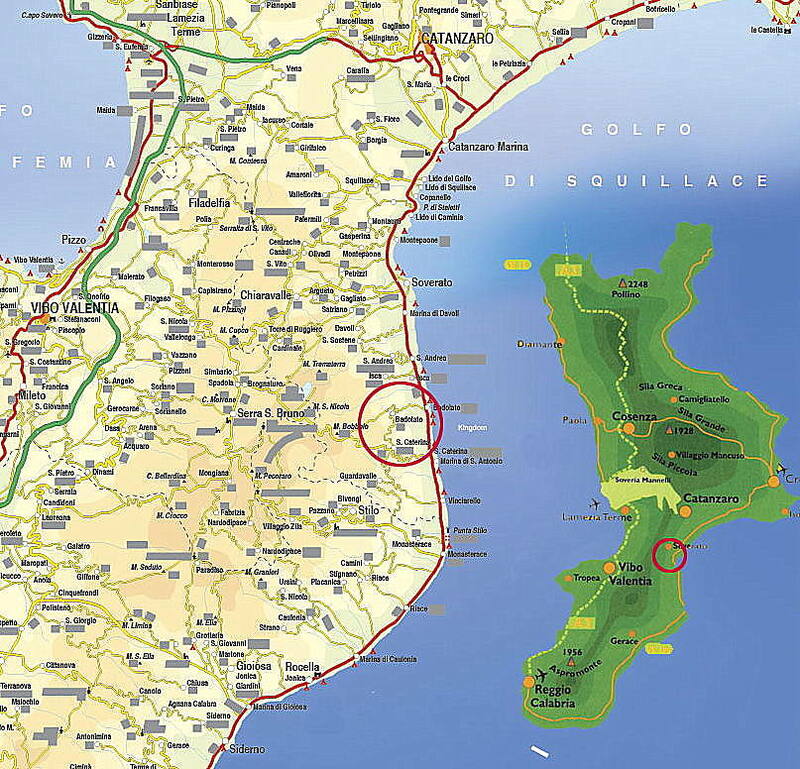 Calabria is in the bottom of the "boot" of Italy -- seen in the green image on the right on the map. 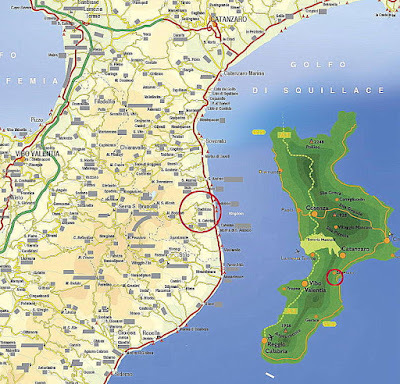 Badolato is located in the province of Catanzaro in Calabria, close to the Ionia Sea, near the heel of the boot, as seen in the red circle. 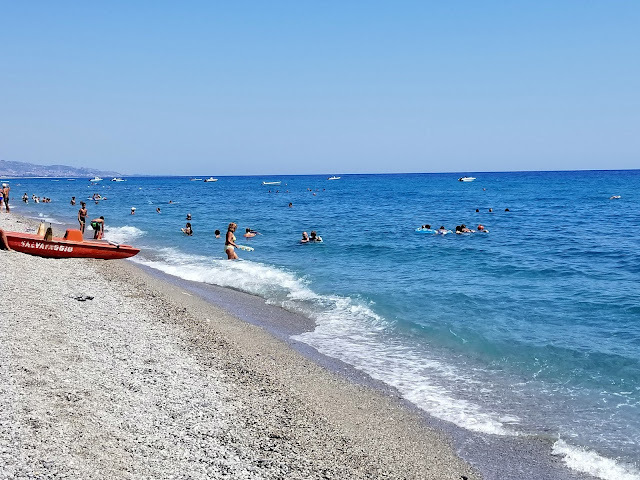 When we visited my husband's hometown of Gioiosa Ionica--click here--we were in the province of Reggio Calabria, located further south down the sole of the boot. If you enlarge the photo you can see the distance between the towns. 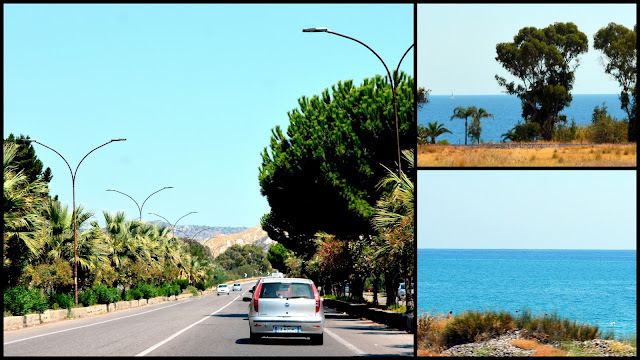 The drive from Gioiosa Ionica to Badolato was pleasant. The roads are in good condition and offer beautiful glimpses of the sea. We were excited at our first glimpse of Badolato Superiore as we approached it from the newer marina section. 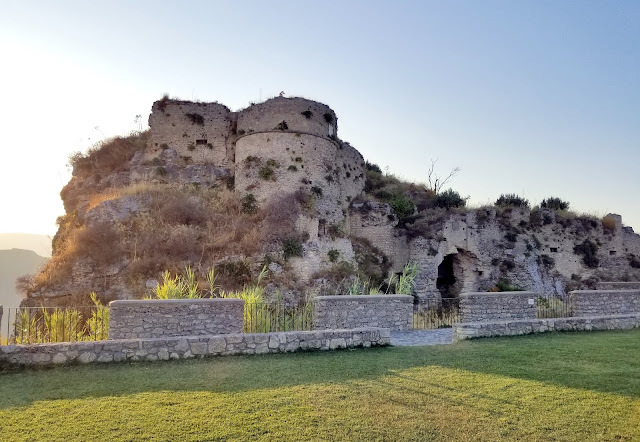 Badolato suffered many devastating earthquakes, the last in 1783, and also a disastrous flood in 1951, and so the massive castle that once stood at Badolato's very top had to be demolished in the 1970's as its condition was too dangerous. 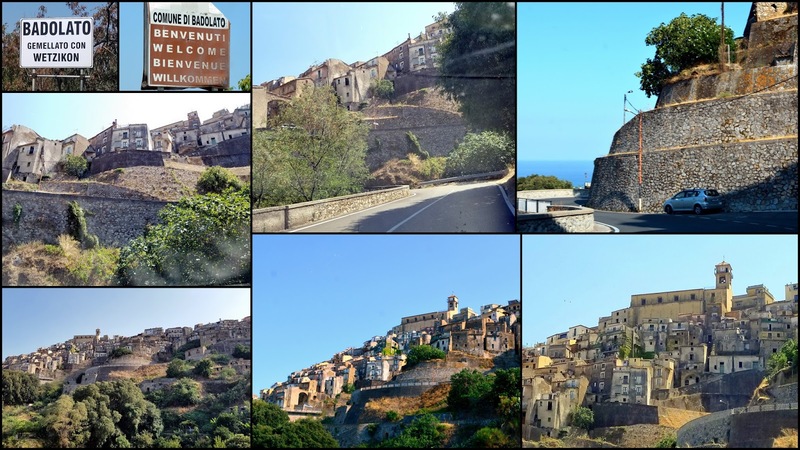 Badolato is surrounded by winding medieval era stone walls and a road which leads up and around to the top. 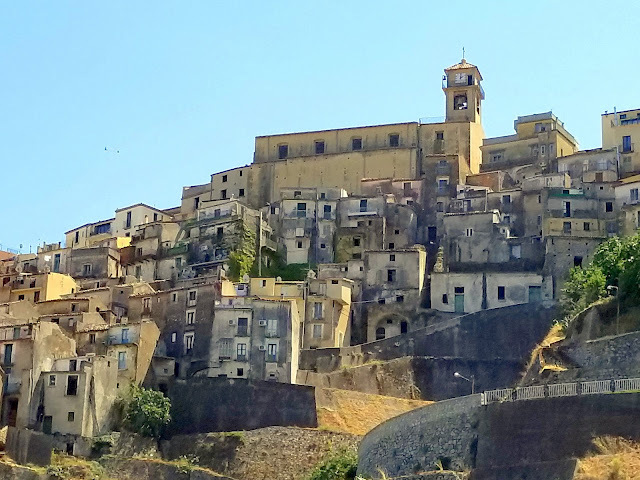 The buildings and churches clung to the hillside at precarious angles and made me wonder as to how they were built! The panoramic views as we drove up revealed the coast and the Ionian Sea, deep valleys, high mountains and rolling hills full of olive trees. 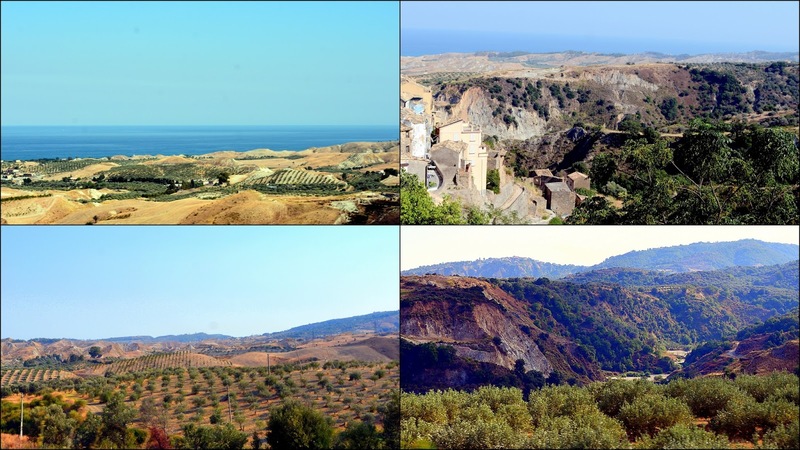 Badolato is known as an area of olive oil and wine production, as well as companies that breed cattle, sheep, pigs, and goats. In olden days, as in many areas of Calabria, women hand-loomed woolen blankets and fabric. In fact, my husband remembers playing under the loom his mother used in their home as a child. When we entered the town at the top we parked in the Piazza Castello, the large space where the castle once stood. It was already 2:00 PM, and we knew if we did not stop for lunch everything would soon close for the afternoon siesta. 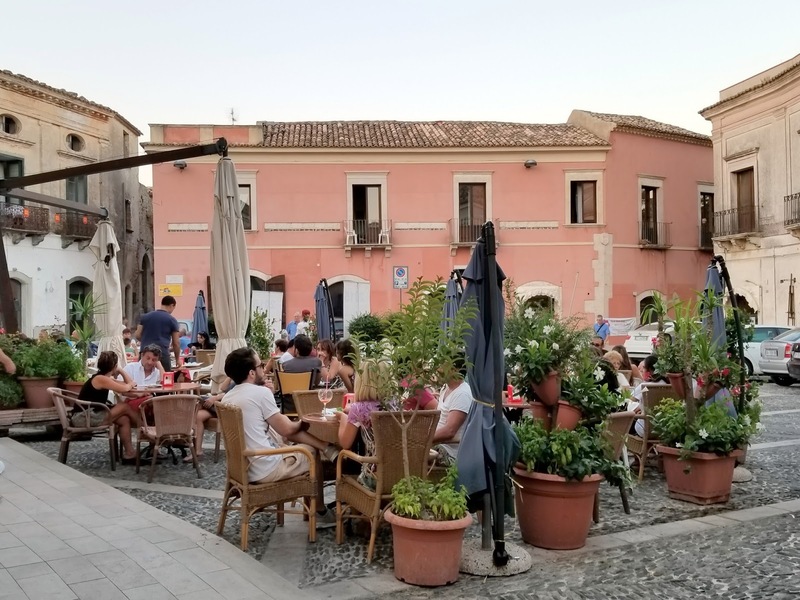 Southern Italy still keeps the tradition of a large meal midday lunch around at 1:00 PM, followed by shops closing during the heat of the day, until around 4:00 PM, and then reopening afterward. Many people nap or relax at home during those hours. 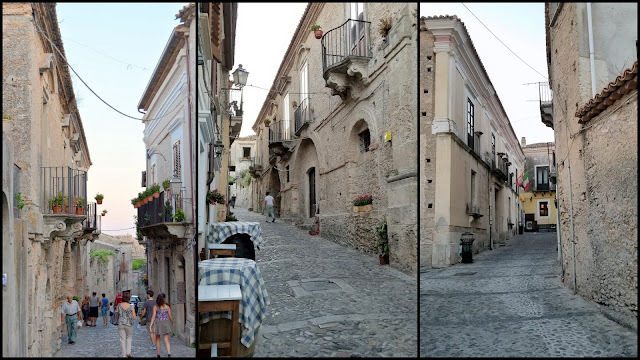 We stopped at the bar/pizzeria on the left in the photo above, but the woman who worked there told us they were no longer serving but suggested a place across the piazza which served a traditional stuffed eggplant dish which we enjoyed. After lunch, we walked the quiet winding and narrow streets of the town. 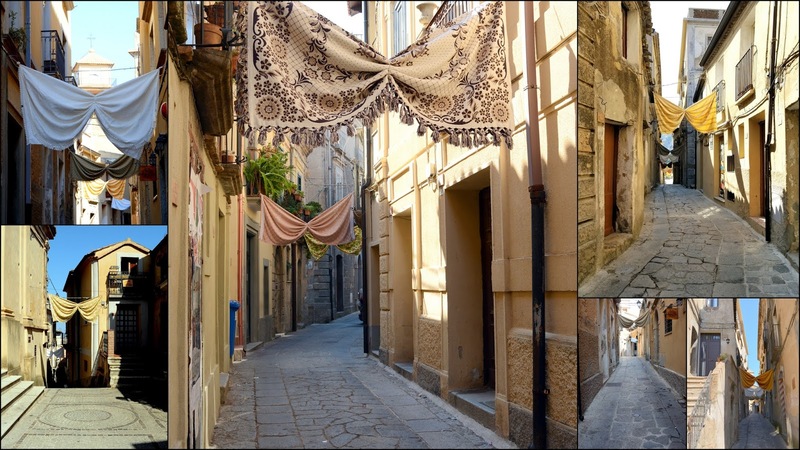 I was puzzled by the decoratively twisted tablecloths hanging across the streets from opposing balconies but thought they looked lovely. It was almost as if the town was welcoming us! I found out later from an ex-pat American blogger who lives in Badolato, Michelle, of Bleeding Espresso, that the tablecloths were hung as an art and architecture festival was going to be held in Badolato that week. I had hoped to meet Michelle, as I discovered her blog many years before and also follow her on Instagram and Facebook, but unfortunately, that did not happen. 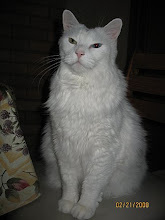 I did not have a way to contact her immediately and since it was the siesta hour she was at home resting. 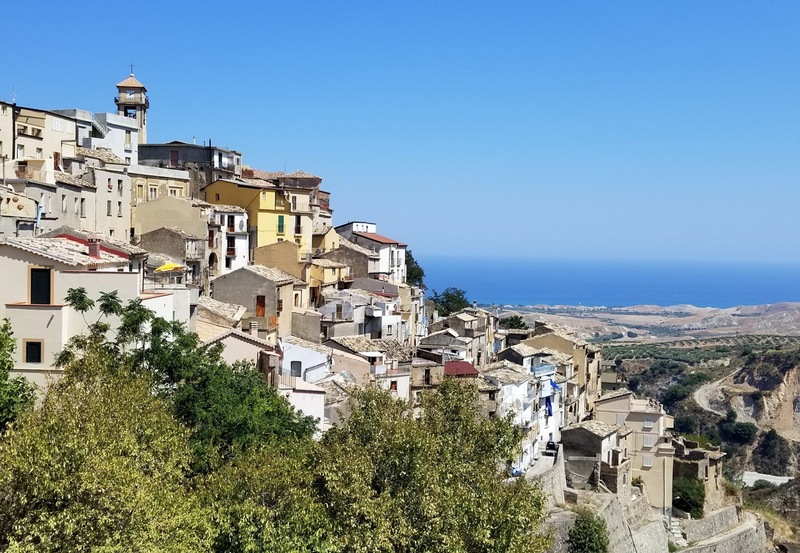 Michelle is a talented writer and has published a wonderful e-book available on Amazon, called 52 Things to Do and See in Calabria, that I highly recommend if you are thinking of visiting this part of Italy one day. We walked past one of the remaining partially standing watchtowers that once guarded the city. 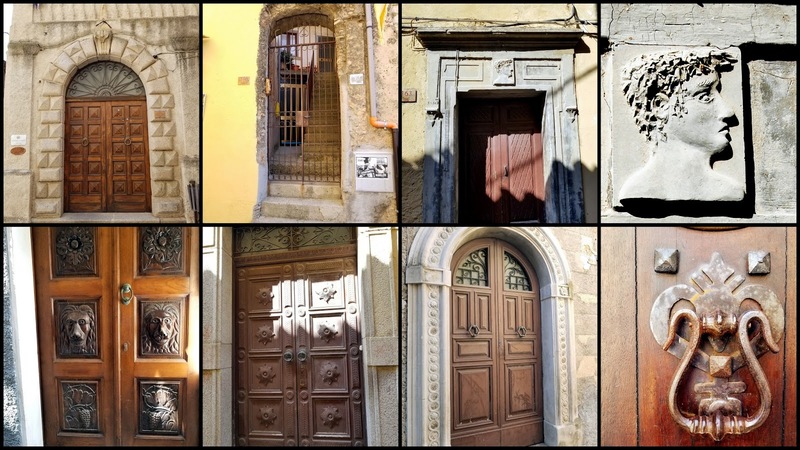 ..and all the different eras of the town revealed in both its ancient and newly refurbished and modernized architecture. 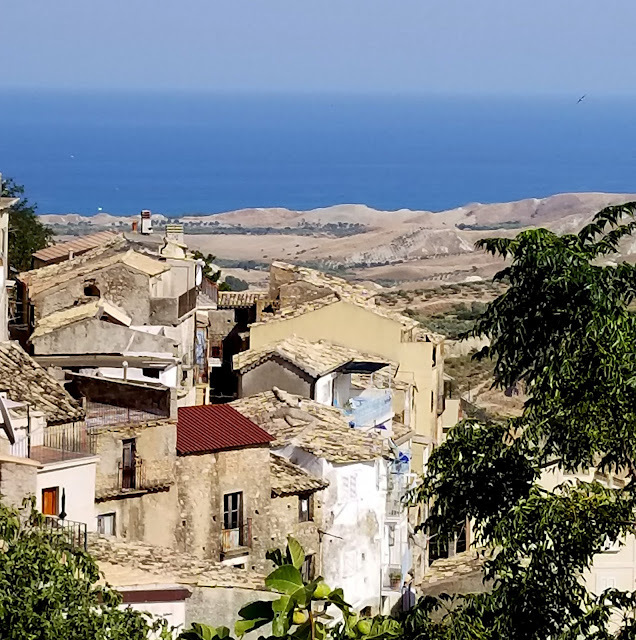 The population of Badolato has dwindled over its thousands of years, especially after World War II when Southern Italy was very impoverished. Its people immigrated to the United States, Canada, Argentina, Brazil, Germany, Switzerland, and Australia. 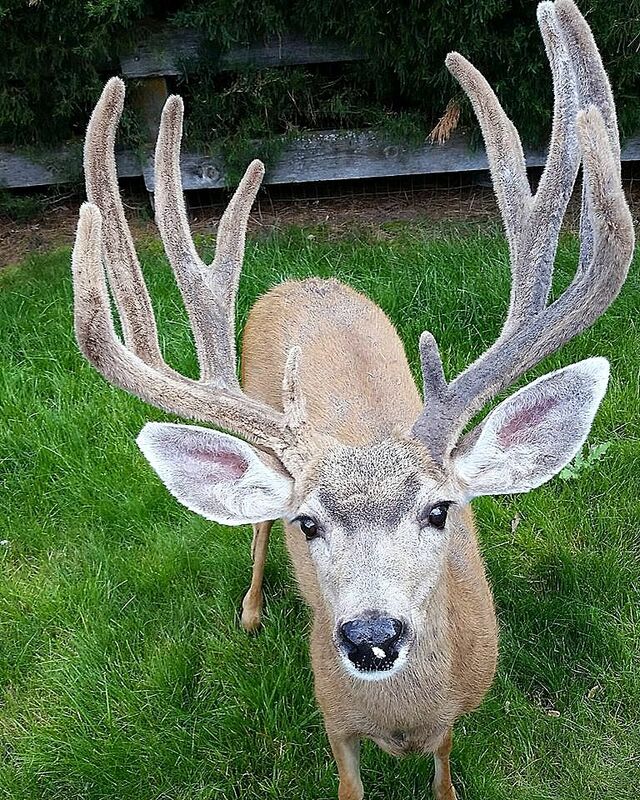 Now there is a very small year-round population in the hundreds. It may be the reason that Badolato is a welcoming place now for new immigrants seeking a new life. You can read a story at this link about how in 1997 a boat full of Kurds fleeing oppression landed near Badolato and were welcomed into the city. Tourism has also been a boom, and some native Italians from the north and Europeans and Americans have bought properties as vacation homes. After walking the inner streets of Badolato we found a path that encircled the outer walls of Badolato and had more stunning views of the valley, sea and southern part of the town. Hanging down from the walls we saw prickly pear fruit hanging from long cacti. 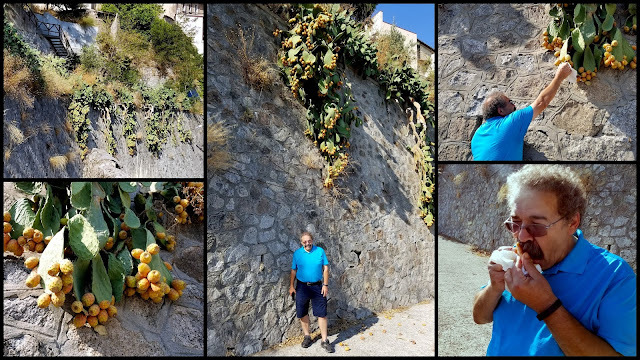 In Italy the fruit is called "fichi d'India," but the genus of the cacti is Opuntia ficus-indica. My husband has fond memories of eating ripe fichi d'India as a child in his hometown, and could not resist picking one to sample. I think this will also be a memory he will always treasure! 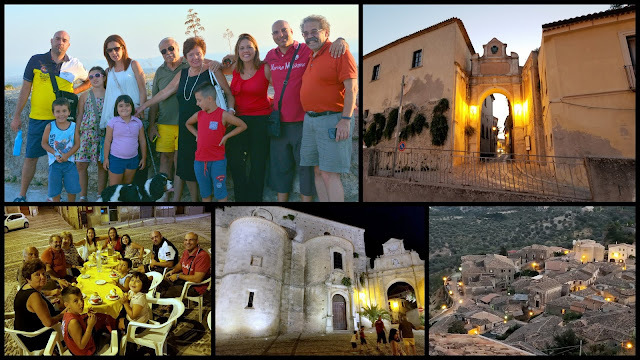 We did not want to leave Badolato, but we knew we had to return to Gioiosa Ionica to meet family and see more of the preparations for the Feast of Saint Rocco. 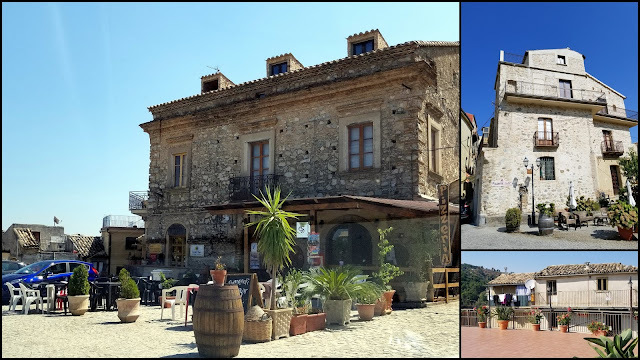 Although we did not get to visit any of the many churches of Badolato, as they were closed during siesta, and we did not see many people or open shops, it was such a wonderful experience for us to visit this town and it won our hearts in a way that can only be because there is an ancient connection there that can't be explained. I felt that same connection when we visited Ireland a few times years ago. There is a definite sense of the familiar, a sense of "deja vu" that is priceless. There were other wonderful towns we had the opportunity to visit while we were staying in Gioiosa Ionica in Calabria, including two that had 10th-century castles that still were standing and another town which is known for its excellent water that enables the preparation of a culinary delight it is famous for. They will be featured in future posts. 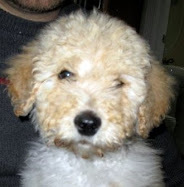 Of course, I'll also be blogging about life here in Colorado. 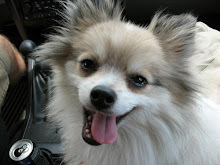 Please visit me again!